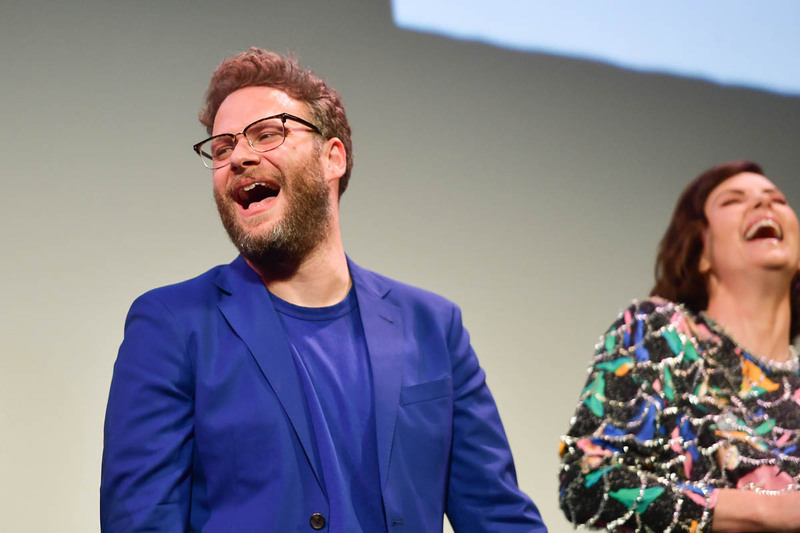 If you weren’t talking about Us at SXSW, chances are you were talking about the surprise Boyz II Men sing-a-long and dance party with Charlize Theron and Seth Rogen following the world premiere of Long Shot on Saturday. Boyz II Men! ABC! BBD! And the entire Paramount Theatre (about 1,100 people) up on their feet! I’m STILL NOT OVER IT. There is some context for the surprise here though: Boyz II Men appears in the film as themselves. In Long Shot, Charlize is Charlotte Field, the Secretary of State with bigger political ambitions. But, in another life, she was the teenage babysitter to Seth Rogen’s Fred Flarsky, who has since grown up to be an outspoken stick-it-to-the-man journalist. Their re-meet cute takes place at a fundraising bash that “the Men” are performing at, taking us right back to their 90s heyday and Fred and Charlotte’s (then-platonic) relationship roots. What’s amazing to me is that nearly 25 years after “the Men” released “I’ll Make Love to You,” their rose-filled renditions of the song both on-screen and in person still slay just as strongly then as they do now. A jam is a jam is a jam. Anyway. I don’t think I’ve ever seen Charlize so relaxed and gleeful in a public setting… ever? In fairness, it was a Saturday night. Plus, at the Q&A, director Jonathan Levine (50/50, The Wackness, The Night Before) admitted, “I didn’t want to talk I’m too drunk,” and seconds later, when the mic made its way down to Charlize, she said, “I don’t know why I have a mic because I’m drunk too!” After getting some laughs, Charlize went on to say that she was “hashtag blessed” to be in this movie, and that it was “her dream to be in a Seth Rogen movie” but that she didn’t want to just play “the girl.” So, she boarded Long Shot as a producer and star. She seemed SO happy about its reception at the festival, which she called her “favourite,” citing her past experiences at SXSW in 2017 for Atomic Blonde. And goddamn is Long Shot funny and so much FUN. The crowd was truly LOVING this movie. If Us brought the gasps, Long Shot brought all the laughs and joy barely 24 hours later, in the same theatre. O’Shea Jackson Jr. is sidesplittingly funny as Fred’s best friend, and Seth, who rarely gets enough credit for his acting chops, really shines as this uninhibited yet sweet character. It’s got heart, it’s got gossip, and enough charm to make you wish you could watch it again as soon as possible. I loved it. In the words of Boyz II Men, it was “so hard to say goodbye” to this movie. Right. So about that gossip – remember those Charlize and Alexander Skarsgard dating rumours that have been swirling for years? Well, guess who plays a not-so-thinly-veiled Justin Trudeau avatar in the film? Yes, it’s Alex. And yes, he’s trying to woo Charlotte, and both countries appear to “ship” them. Coincidence or conspiracy?